Has Mega Man met his match with these feisty female androids? In this day and age, there are many indie games that mimic games that came from the classic 8-bit and 16-bit formula. One series I could never really get into though was the Mega Man series, at least in the indie form. 20XX was a game that came out last year for the Nintendo Switch that took the Mega Man formula with rogue-like elements to great success, and therefore felt much more accessible. Now, developer RetroRevolution is taking a stab at the classic Mega Man gameplay with their title METAGAL. The story of METAGAL follows a group of female androids created by Dr. Ray. One day a villain shows up to attack and abduct both Ray and all of the girls to be able to use them for war. After the abduction happens one of the earlier models named Meta shows up realizing everyone’s been abducted and sets off on an adventure to rescue them. These types of games usually don’t feature many story elements and METAGAL doesn’t feature this as well, but there is more than expected. Not many cut-scenes are used, but once you get to the ending, there’s actually a lot of lore found. Not from a literal standpoint mind you, but it has a lot to explain for all the characters, who this main villain was, and some background information that many of these types of titles just don’t have. It was a pleasant surprise and added some extra motivation to continue on. Gameplay-wise, METAGAL is a 2D side-scrolling platform with combat elements. It follows the classic Mega Man formula very closely, outside of a few added gameplay elements that make the title unique. As you make your way through the levels, you’ll be platforming across side-scrolling stages, fighting off enemies with projectiles, and of course, every stage ends with a boss fight where you can defeat them and obtain their special weapon. Because of this, the way you progress through METAGAL is somewhat predictable. Once you start the game and finish the tutorial mission you have a level select screen where you can choose any of the main four bosses and go through their stage to move on to the rest. Your goal is to clear them all and unlock the final four stages to finish the game. As you play, you’ll notice the further you get into METAGAL the more you’ll see that Mega Man formula with hidden upgrades, secret areas, and the classic boss-rush you’ll have to complete before taking on the final boss. This is very much a Mega Man title in essence, but as stated previously, METAGAL does change up the formula somewhat to make it feel unique. These unique changes come in the form of special weapons, playable characters, and even being able to change the difficulty. Controls were fluid enough, although they felt somewhat awkward from how I played an action title like Mega Man. Having the dash set to the X button threw me off and not being able to remap any of the buttons to anything else was a little disappointing. Firstly, it should be noted about how special weapons work. Every Mega Man title has special weapons that you earn by defeating each boss, but how you use them in METAGAL is somewhat different. Right away, one of the first weapons you get at the start is a healing weapon, meaning you don’t have to look for upgrades if you want to have the ability to refill some of your health in the middle of combat. The trick is how you will use these special weapons in battle. Instead of having a finite amount of ammo, you have an energy gauge that recharges every time you use a special weapon. This means that you can use each special weapon an infinite number of times outside of the healing one, you’ll just have to wait 3-5 seconds for the gauge to recharge before you can use them again. This is especially useful because some of the stages have areas that are designed for you to have to use certain special weapons to be able to navigate and get to the end of the stage. You may be wondering why I haven’t addressed the difficulty yet, and that is to say it’s hard being the type of game it is, but not to the frustrating point. There are a good amount of intricate and technical platforming areas that you’ll have to get through and it can become frustrating, but METAGAL features a very forgiving continuing rebirth system. When you reach a checkpoint you can infinitely continue at that checkpoint and you don’t have a certain amount of lives to worry about. You will also be picking up little rings called ‘Rebirth Rings’ to help this reviving aspect further. Whenever you die you can instead choose to do a rebirth and not use a continue to restart at a checkpoint, but rather restart in the room where you died. The character you can use in METAGAL is probably my favorite aspect of the game. When you clear the game for the first time as the main character Meta, you gain the ability to replay from the beginning as any of the other main bosses that you fought throughout your playthrough. Although there is no story content when you replay as one of the other characters, they have their own custom move-sets and can perform many techniques that Meta can’t. This includes going through their own stage and fighting Meta as an unlockable boss. Speaking of post-game content, considering METAGAL only has eight stages and only cost $5 on the eShop, I was barely expecting to get an hour out of it. By the time I had beat the final boss and unlocked all the other characters, I had spent about three hours which I thought was an appropriate length for a title like this. That time did not count experimenting with the other characters you unlock once you beat METAGAL. Regardless, you do get quite the bang-for-your-buck with this game that it actually feels like METAGAL is under priced..
Graphically, METAGAL looks very similar to Mega Man obviously, but has an art style somewhere between an 8-bit and 16-bit game of that type. For what it’s trying to replicate it does look great, at least until you start moving. Unfortunately, there is a lot of blurring that happens with your character while they move and it can get somewhat disorienting. Other than that, the frame rate is solid and the music stays true to the chip-tunes classics we were inspired by. 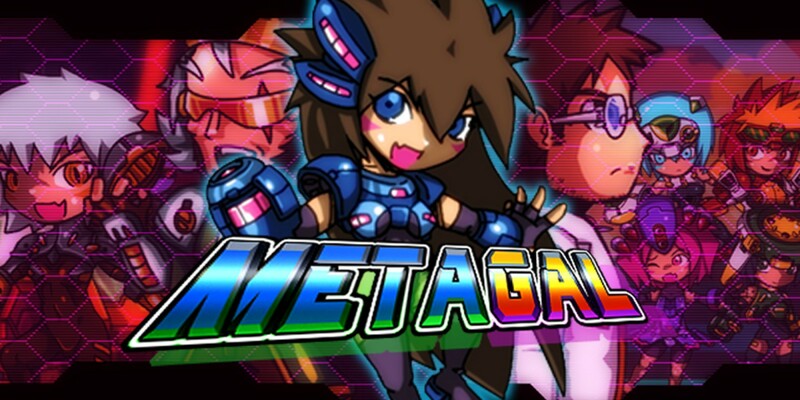 METAGAL is a great cheap alternative to the Mega Man style that stands well in its own right. You can tell the developers love the Mega Man franchise with their lovingly crafted care of the world, characters, and gameplay. This is an easy game to recommend, especially for its budget price and any fan of action titles should enjoy this one.